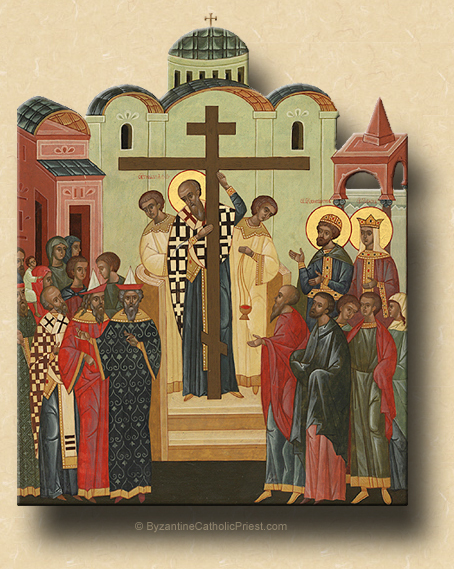 9:41 AM 9/14/2014 — We celebrate the Feast of the Exaltation of the Holy Cross by reading a Gospel verse with which we are all familiar. Some of you are old enough to remember watching a baseball game on television and seeing a man seated behind home plate wearing a rainbow wig and holding up a sign which said, “John 3: 16.” Well, this is that verse: “God so loved the world, that he gave up his only-begotten Son, so that those who believe in him may not perish, but have eternal life” (Knox), the linchpin, if you will, of Protestant theology, so forcefully preached by that great American evangelist, John Wesley. He was an Anglican layman, born in England, who set out to reform the Church of England from within, but unintentionally ended up founding his own religion, which today is known as the Methodist Church. He died in the United States in 1792. Wesley’s particular contribution to the history of American Protestantism was an institution that continues to this day, called the Revival. You’ve seen them before on television. Billy Graham was a big proponent of the revival. It can take various forms, but the one part of the revival which never changes is when everyone comes forward with their hands raised up declaring they are saved. And how can someone declare himself to be saved? Because, in John 3: 16 Jesus says that all you have to do is believe in Him and you’re saved. Nothing else is required. No sacraments. No priests. No Eucharist. No confession. Nothing. Just declare your faith in Jesus, and you’re going to heaven. It’s a classic example of Protestants doing what they do best: taking an isolated verse of Scripture totally out of context, and turning it into a maxim of dogma all by itself; which, of course, is not how the Bible is meant to be read. Did you ever see a Dracula movie? When you first see Dracula in a movie, who is he? He's this suave, sophisticated man about town, slicked back hair, always dressed to the teeth, seducing impressionable women with his perfectly polished charm; but, he never walks in front of mirrors, he never comes out in the daylight, because if he did, who he really is would be exposed. He makes darkness his home to perpetuate the illusion of being just like everyone else. And in the Church of Jesus Christ we have many spiritual “Draculas”: men and women who go through the motions expected of them as members of the Church, but they have some secret, some dark room in their hearts where the light is never turned on and where the curtains are always drawn lest anyone see inside. For example, when husband and wife make love, they close the blinds and lock the door, but not for any sinister reason. They hide what they're doing from prying eyes simply because it is something for themselves alone and is no one else’s business. But when a person is there with someone who is not his spouse, he closes the blinds and locks the door for a very different reason: not out of concern for modesty or privacy or the sensitivities of others, but to hide what he knows is wrong. And so a part of his life must then be lived in “darkness.” He is, in fact, living two lives: one in the daylight and one in the darkness, struggling all his life through to keep the two from ever touching one another. And when, out of carelessness or spiritual fatigue, the two collide—as they usually do—he must suffer the embarrassment and the scandal that his secret life causes in the eyes of those who knew him in the light. "For God did not send His Son into the world to condemn the world, but that the world might be saved through Him" (3: 17 NAB). And the world is saved through Him because He died on the Cross to pay for our sins, so that we wouldn’t have to. But what that presupposes is that we’re now going to live as if we’ve been saved. * Because it is a feast of Our Lord, the Feast of the Exaltation takes precedence over the ordinary Sunday in both the Ordinary and Extraordinary Forms of the Roman Rite, so that the Twenty-Fourth Sunday of Ordinary Time [OF] and the Fourteenth Sunday after Pentecost [EF] are both suppressed. In the Byzantine-Ruthenian Rite, not only is the Fourteenth Sunday after Pentecost [BR] suppressed in favor of the feast, but also the Sundays preceding and following it, which are known respectively as the Sunday Before the Exaltation and the Sunday after the Exaltation. Indeed, in some traditions, this feast is so important that the entire Church Year is deliniated by that which occures "Before the Holy Cross" and "After the Holy Cross."